Over slightly more than a week in June of 2009, a large new crop picture appeared at Milk Hill in southern England in three separate phases (see milkhill2009c or lucypringle.co.uk or lucypringle). Almost two years later now in April of 2011, still no one seems to understand what they were trying to tell us there! 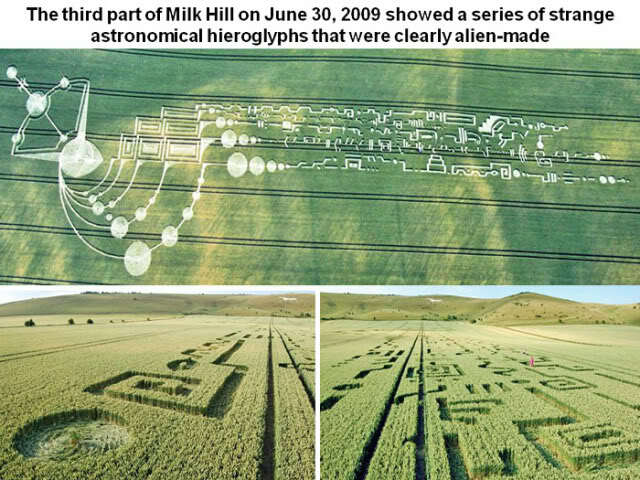 While we were studying several crop pictures which may predict an enigmatic “planet X” for December of 2012, we came across some distinctive astronomical symbols in Milk Hill of June 2009. Those distinctive symbols suggest that it may refer to an upcoming date in June of 2011. 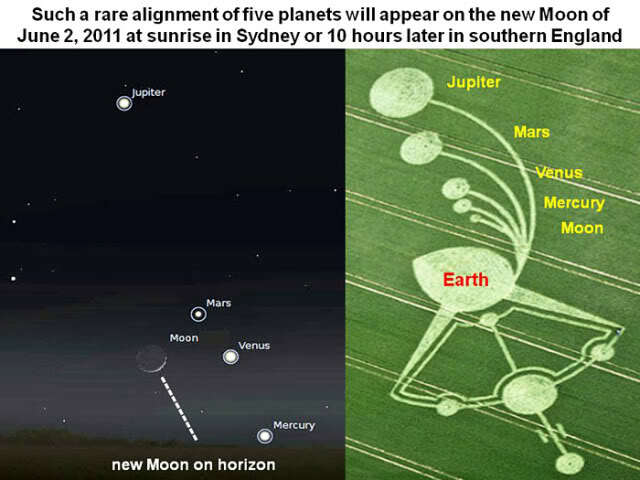 To be more precise, the Milk Hill crop picture of 2009 seems to show a rare planetary alignment which will only occur once in the near future on June 1, 2011. It also shows an extra anomalous symbol to represent a “new astronomical object” in our solar system, currently of unknown origin, which will supposedly be seen on the same date. The new object could be a “comet in outburst”, as we saw predicted in crops between 2005 and 2007 for Comet 17P Holmes (see time2007g or time2007h). Alternatively, it could be our first glimpse of the enigmatic “planet X”. Interestingly enough, those crop artists counted it in their Milk Hill field diagram as an “extra planet” between Mars and Jupiter. The unknown object is not Comet Elenin, nor is it Comet Holmes in a second outburst.